I know that I should stretch, wash my water bottles regularly and not pour that next glass of wine. But what we should do is so not fun. In fact, most things that are “good for us” are miserable, like flossing and flu shots. But everything else that’s awesome—bubble baths, massage, naps—those fall under the category of “pampering,” suggesting they’re an indulgence, not a fundamental need. Then I met my friend and running partner, Lindsay. Lindsay treats pampering like it’s her job. I once touched her arm and was so taken by the luxe, velvety feel of her skin, I thought she was magic. So relaxed. So pampered. So smart. “You’re so soft!! !” I exclaimed, self-consciously rubbing my berber carpet-like arm. “I exfoliate,” she replied, as if she just explained how brushing makes your teeth clean. I bought a loofah that very day. When I was sidelined by an IT-band injury, Lindsay suggested a massage. Up until that point, I had only gotten a massage when my parents gift-certificated me a hot-stone session, and I had to force myself to stay awake for fear I’d miss the bliss. It was, indeed, an indulgence. But 30 minutes whimpering under the powerful hands of Lindsay’s Russian massage therapist at the local YMCA, and I realized massage was neither Swedish nor relaxing. It is Russian and 100% necessary. I let Lindsay be my guide dog for all-things good for me, and she was the one to introduce me to Nourish: in the form of hand-made, rosemary-scented bath salts to soak my weary muscles. Nourish creates some of the best natural bath products I’ve ever encountered. From salts to soy candles, this family-owned business produces some of the best, chemical-free bath boosters you can imagine. (I grew up with my mother warning that Mr. Bubbles was going to work his way into my “parts” and wreak havoc. Mom, you can relax knowing I’ve gone all natural.) 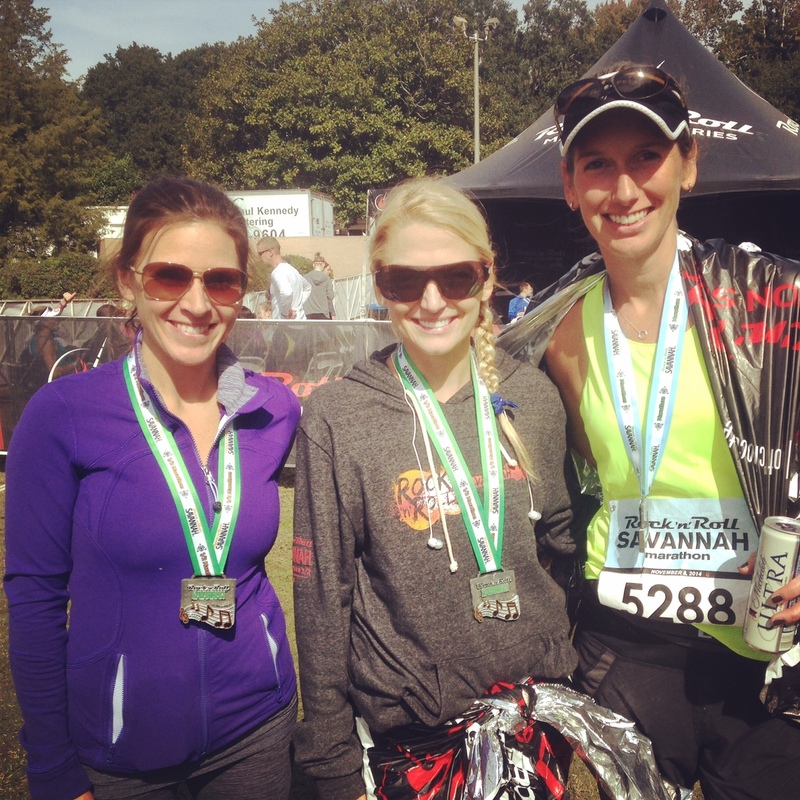 Nourish also gives back to the community; they’re one of the sponsors of Publix Savannah Women’s Half Marathon and 5K. Because I’m a race ambassador, Nourish sent me some products to review and give away, which I’m more than happy to do for a company I’m already obsessed with. Because the more runners who know about Nourish, the better equipped our bodies are to survive the toil we put them through. After my 9-mile training run (yes, for the upcoming Publix Women’s Half! ), my hips and low back felt as if a welder was holding a blow torch to them, trying to fuse them back in place. I channeled my inner Lindsay—who I can bet was already steeping in her own fragrant bath complete with candle, face-mask and cabernet—and turned on my tub. My husband came in and asked, disgusted, “What are you doing?” as if I were skinning a cat. “I’m running a bath.” He looked perplexed. “Because I’m sore.” (i.e. Not because I’m indulging myself). As I loofah and bath gel my way to happiness with the Lemongrass & Rosemary Moisturizing Wash, I wonder why I don’t do this more often? I smell like a delicious lemon drop. A soak, a massage, a candle—these things aren’t extravagant. They aren’t indulgent. They’re the necessary ways in which we tell ourselves we’re worth the trouble. And ways in which we tell ourselves “Thank you.” And “Please keep going another day.” And another day. And another day. Lindsay’s got it figured out. She—her skin, her soul, her mind, her heart—is nourished. Trust the plan: Just when you think it isn’t working…it is. “I remember liking Hal Higdon’s plans–maybe we could try the advanced one,” I offered. “Andrea, we are doing the Hal Higdon advanced plan,” Lindsay said, exasperated. See, I don’t actually follow a plan–at least not in the normal, self-reliant way. 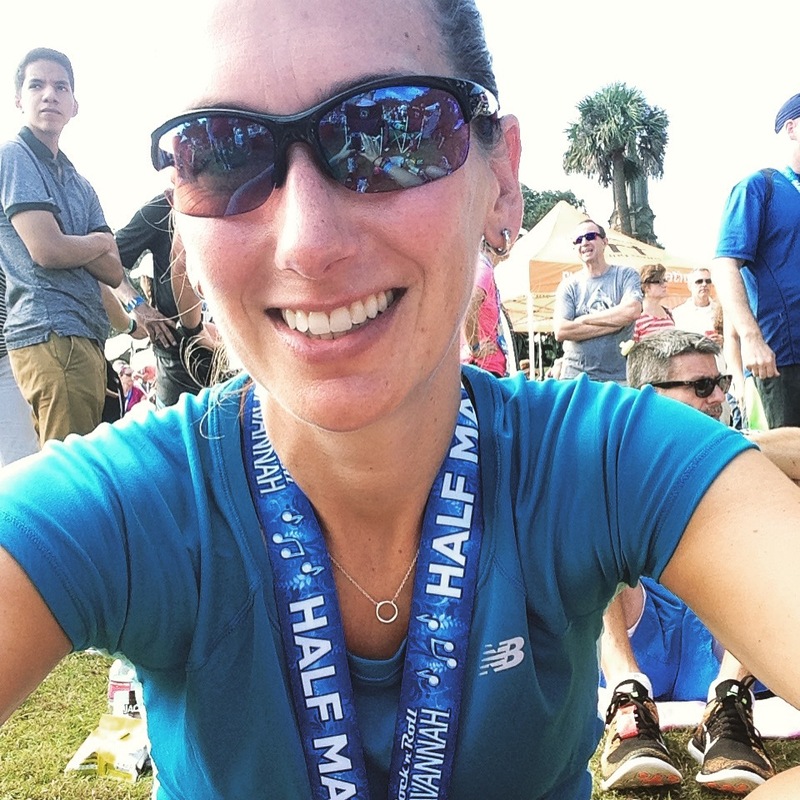 Instead, I show up to each run and ask Lindsay, “So, what are we doing today?” She’s given me the plan–in the form of email, text, hardcopy taped to my forehead–but it’s so much more fun to be surprised. Lindsay doesn’t seem to mind that she’s the gatekeeper of my training–the one who wears the running pants in this partnership, telling me what to do when and how fast. She’s good at it, too. She syncs her Garmin after every run like it’s her job (I haven’t done this once since buying mine in 2009), and if she forgets to start it and a quarter-mile goes unrecorded, she gets mad. 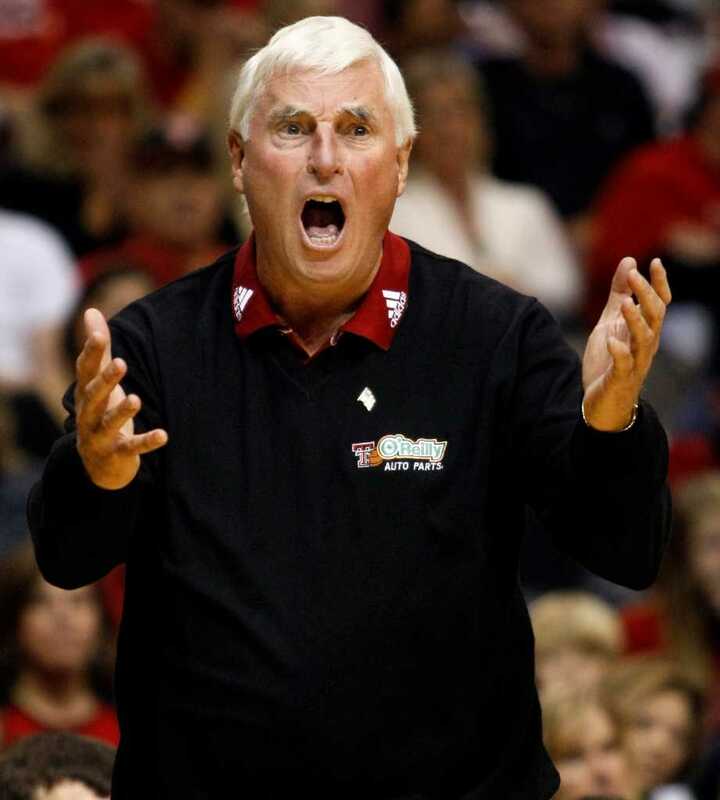 Like, Bobby Knight mad. She’s also a natural statistician when it comes to running. She remembers PRs, medals, race pace–both hers and mine–while I can barely remember that I can’t eat wheat the night before a run. “Did you eat gluten last night, Andrea?” Lindsay often inquires to the closed doors of porta-potties that sit on empty construction sites. “Nooooo,” I call from inside, indignant. If you’ve been keeping up with my whining, you know that this usually stellar path to the Rock ‘n’ Roll Half has been tarnished by injuries and illnesses. Then, Sunday morning I woke feeling like I swallowed thumbtacks–the same day Lindsay finally finished up her round of antibiotics. Naturally, I want to blame the plan–the first I’ve ever done that calls for a significant amount of speed work. It’s ironic that she poses these questions to me since I don’t even know the plan, and also because my approach to running is a little more … organic. And it has. Or at least it’s starting to. By the grace of Hal, the next 10 miles of that long run were swift and painless. 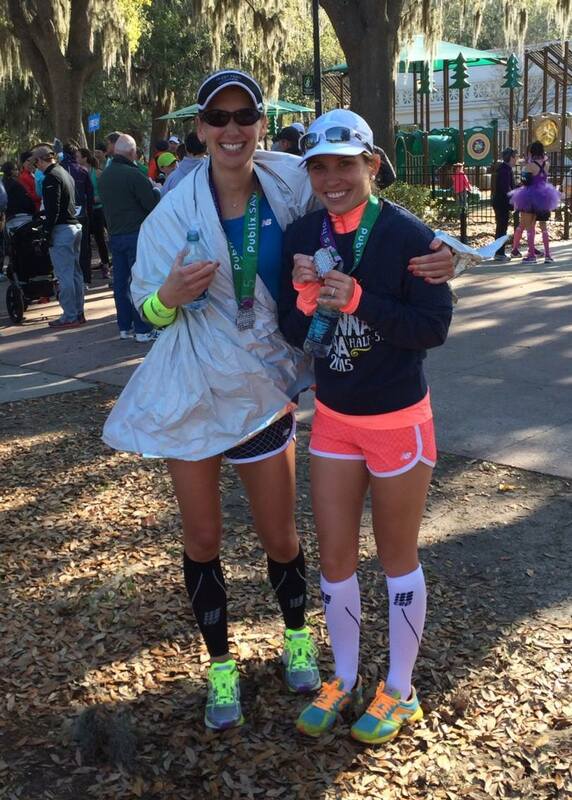 We ran negative splits and came in hot; our last mile was an 8:50 (or so I kinda remember–Lindsay can edit). “I think the plan is working!” we squealed, like only people who wear arm warmers and compression socks can. We’re three weeks out from the race. Past experience should tell me that this is the time I start to see my running goals as attainable. Three months ago, not so much. It’s easy to forget. And it’s easy to doubt that all those days of training, slowly adding mileage and speed, add up to one (hopefully) spectacular moment. Even the setbacks–the ugly runs, the injuries and illnesses–are part of the equation. Coming to you on April 2, 2016! 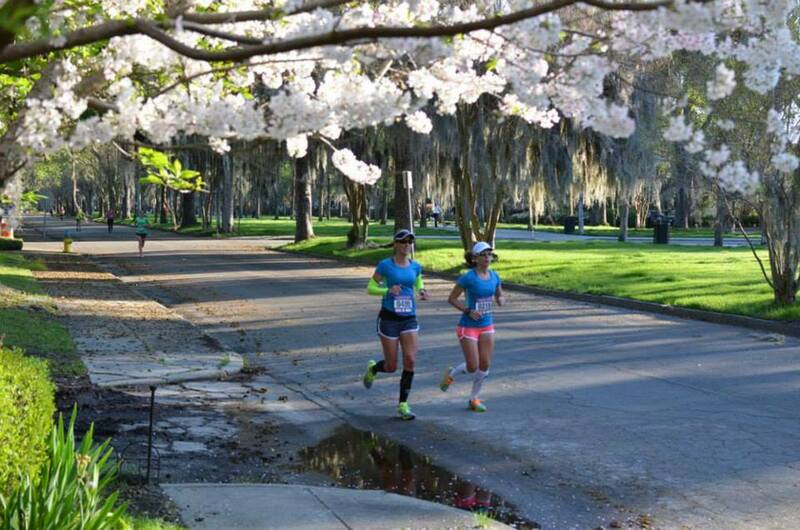 Last spring, I participated in my first all-women’s race. 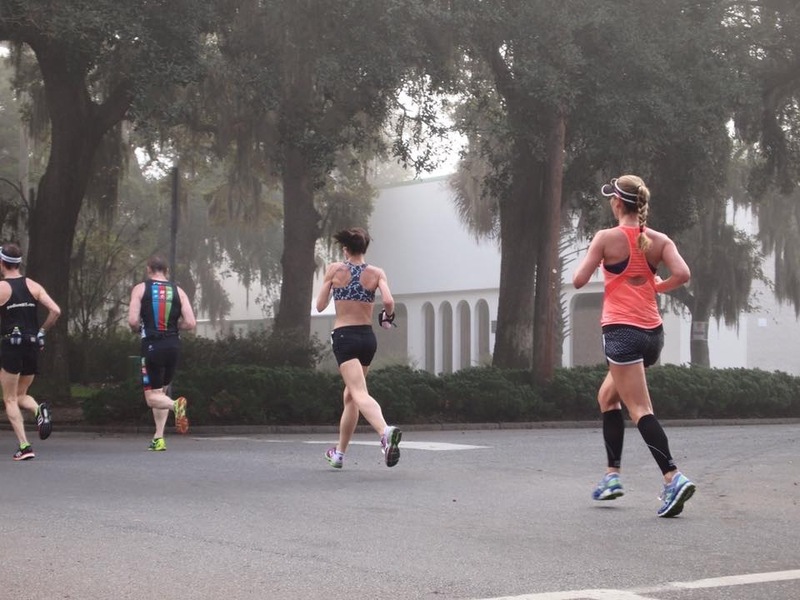 Though I run with girlfriends on a regular basis, I wasn’t sure what to expect at the inaugural Publix Savannah Women’s Half Marathon and 5k. Would it be…girlie? Like a Lilith Fair concert minus the music, booze and underlying anger for the phallus? As it turned out, the race was one of the best running experiences of my life. For starters, I was in the front. Like, the for-real front. Because when you eliminate half the population from a race, the mid-packers are suddenly leaders, which is where I found myself. I could count the women in front of me. And while they were busy counting who was behind them on the switchbacks, I couldn’t help but feel that we were all counting on one another as well. See, I discovered there’s an almost inexplicable thing that happens when women get the rare opportunity to race together. We’re at once competitive and supportive–which is shockingly possible. Because even more than we want to beat one another, we want to simply race our best–to run among our sisters and see what our legs, lungs and heart can do. Claudia and I raced together that year and held a steady 7:50 pace until the last half-mile when I hit a mental and physical wall. When she said, “Let’s pick it up,” I puffed, “You go ahead.” She hesitated for a minute, then saw in my empty I’ve-got-nothing-left-please-just-let-this-end-and-give-me-my-beer-face that I was, in fact, incapable of picking anything up including my pace, my feet or even my pride. Claudia and me staying the course. She blazed forward and I admired her “I’m still in my 20s” sprint to the finish from a good decade out. Another woman caught me shortly thereafter and said, “C’mon, you got this,” as she passed by. At that point, I didn’t have much of anything left in me. But I did feel like I had the support of every runner out there–every woman who ever put one foot in front of the other not because she hoped to break a land-speed record or score a corporate sponsorship, but because one day she thought–for any one of a million reasons–I need to run. And then for some inexplicable reason, she kept doing it. When I crossed the finish line, Claudia was there to congratulate me on what was still a mighty-fine PR. And then we cheered our friends in, from the girls we trained with to the women who were racing for the first time. 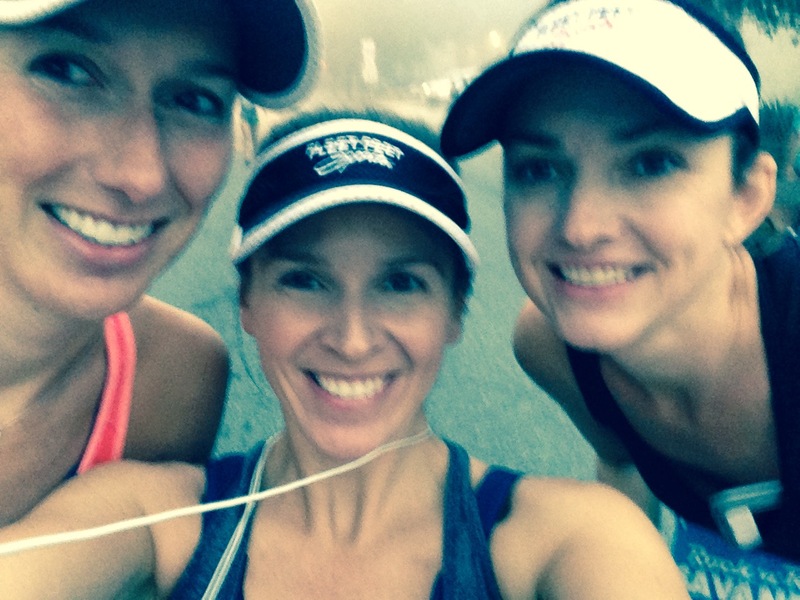 Some jogged, some walked, but we all felt like we were in it together–and I don’t just mean the race. I mean the fact that we are all women. All daughters. All runners of various degrees for various reasons. So I was clearly honored when I was asked to be an ambassador for this year’s race on April 2. For me, it’s a no-brainer. The race is in my city, sponsored by my grocery store, my running store, the magazine I write for, and my favorite shoe/apparel brand, New Balance, whose 860s I’ve been wearing for nearly as long as I’ve been running. I have the privilege of encouraging women of all ages and abilities to join in–to run, walk, or Galloway themselves through a beautiful 3.2 or 13.1-mile course. 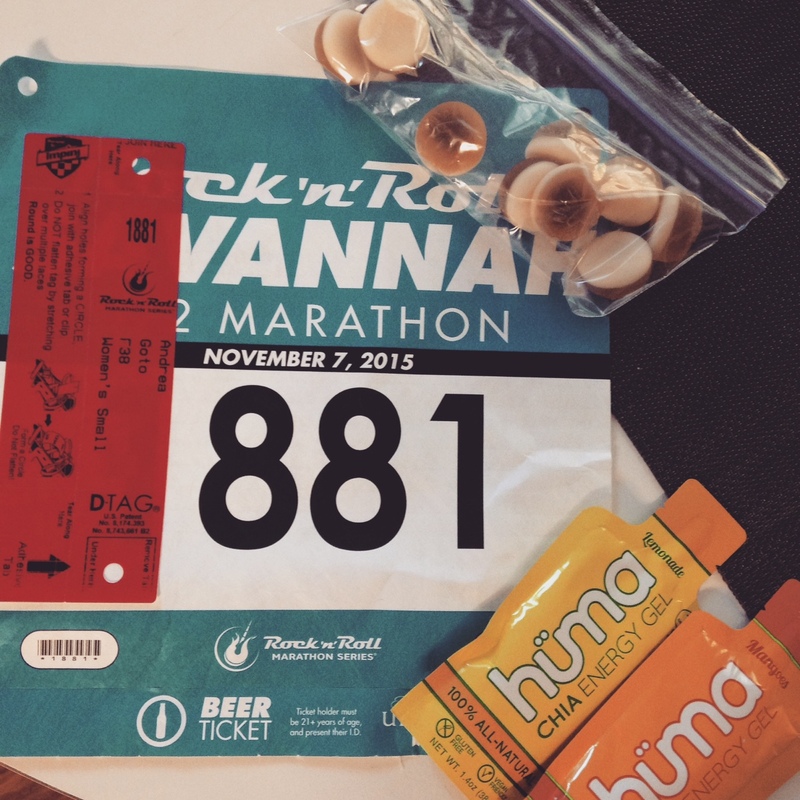 I’ll be sharing tips, discount codes and product giveaways–the first being a $10 half-marathon registration discount when you use the Code: ONTHEROAD10. Follow my blog and the On the Road Facebook page for more information–and feel free to ask any questions and share your experiences to encourage others to join us on this unique journey. I was coming off my fastest year yet. I PR’d or placed in every run I raced in the 2014/15 season. I beat my previous year’s marathon by 24 minutes, finishing at 3:48, and charged to a 1:40 half-marathon PR time. For me, these were not only victories, they were incentives to push harder. 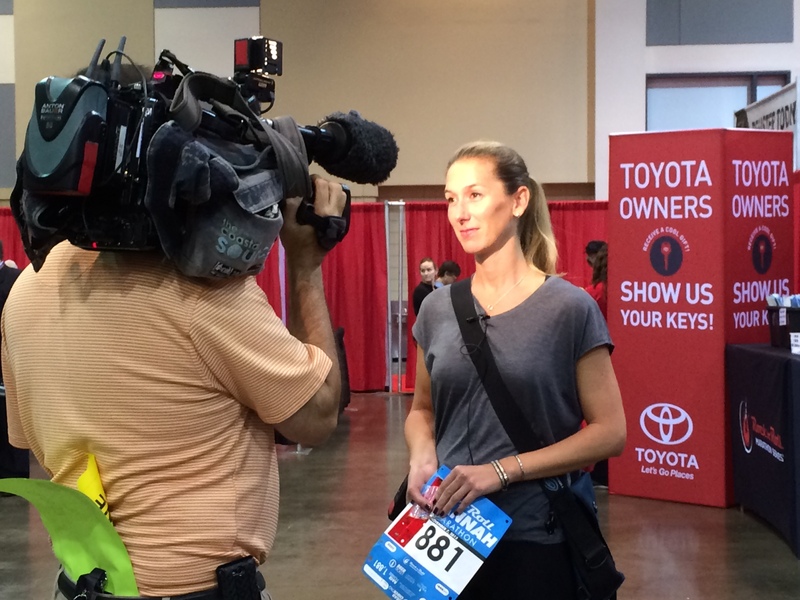 I set my sights on qualifying for Boston in 2015—the Mecca of marathons. I even told people about my goal, knowing that saying it out loud meant I would do it. 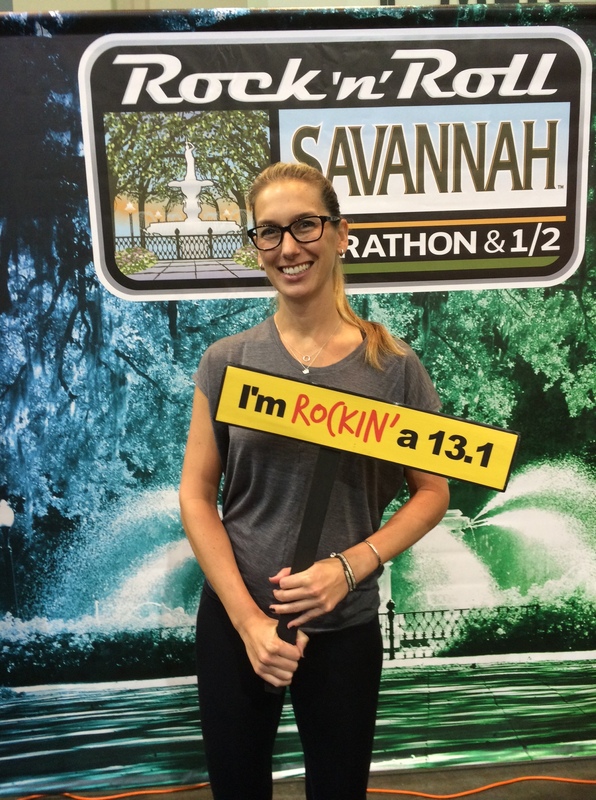 But by spring we had moved into a new home and I let the first qualifying opportunity pass by, knowing November’s Rock ‘n’ Roll Marathon here in Savannah—a course I’ve run many times—would give me another opportunity. Then my friend Robert, who played an enormous role in Savannah’s running community and was a personal inspiration to me, died tragically, and running stopped feeling like that thing I escaped to, could excel at and could count on to kill me but never quite. It felt…complicated. Nonetheless, I half-heartedly approached the first week of my marathon training and immediately irritated my IT Band—my first injury in 20 years—sidelining me for four weeks. So I took it as an opportunity to re-evaluate my goals. 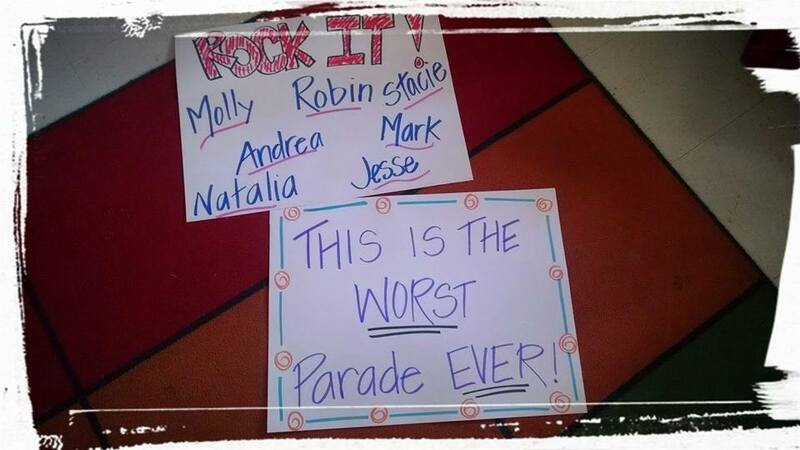 I would put Boston on hold and instead train hard for the Rock ‘n’ Roll half with my running partner, Lindsay. I don’t lose friends. I don’t get injured. I don’t get sick. We don’t. Until we do. And yet I get up four to five days a week, lace up my shoes and run, imagining that it will get easier again, another PR will be reached and Boston will come. Eventually. What is this craziness? 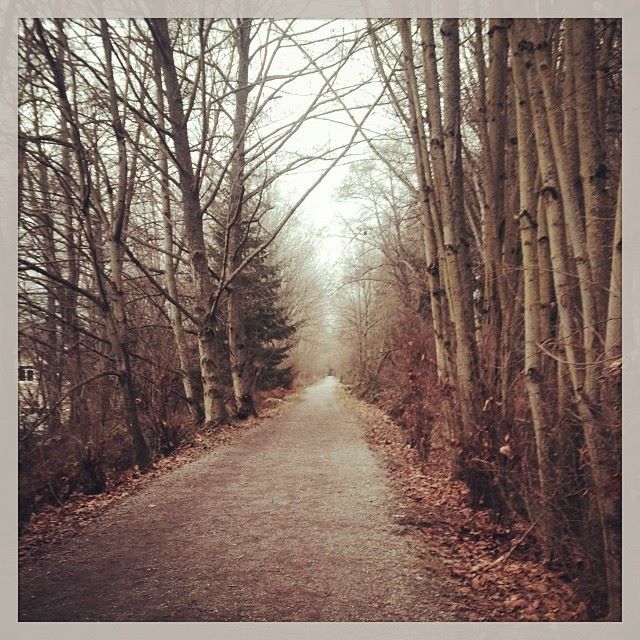 Why am I running hill repeats and tempo runs that make me dry heave? Why am I running toward the next goal as life seems to push it just out of reach? It’s simple really. It’s hope. Every day I wake up and try to do and be better. I say I’ll eat better, drink less, write more, laugh harder, love deeper, run faster. Most times I don’t and then I’ll try again tomorrow. But, every now and then, I do. Today I had my first good run in weeks. Rain forced Lindsay and me inside on a bone-jamming gym treadmill for speed work. My earbuds kept falling out of my ear. Without them I had the limited choice of Fox News and ESPN. I tossed the earbuds, ignored the TVs and just ran. I ran each 800 faster than the last, trying to see how much I could take. Turns out, I could take more than I expected. We’re all distracted and affected by the endless challenges life throws at us. I’m behind on my grading. Our previous house has not sold and I know we can’t float two mortgages much longer. Tomorrow my dad undergoes a back surgery. My sister has discovered a lump in her leg. But I also believe with all my heart that things will improve—that I will improve along with them. Because, really, what are the options? It’s the possibility of tomorrow that makes today’s challenges survivable.